Hi my father John and I (Staci) have owned this farm since 1978 and we want to share this beautiful area with you. Come stay in the cool hills of Templeton. We are located on the famous Highway 46 West, in the heart of wine country. Cute tucked away cabin with a farm feel. Enjoy the weather, views, outdoor space and a romantic cozy cabin. There is no other property like this, 2 minutes from Historic Paso Robles or Templeton. 20 minutes from Cayucos beach and/or Cambria beach. Also, we are surrounded by beautiful oak tress and vineyards. Wine tasting, you can walk/bike to over 10 local winery's. Bar inside, outdoor table outside. My wife and I were up to visit my daughter who attends Cal Poly SLO (25 minutes away) - and at the same time work in some hiking and winery visits. The property is ideally located for wine tasting- if a bit rural - right alongside the 46 highway which is absolutely littered with wineries. In brief, we enjoyed our stay and found property very quaint. The only FYI comment I would provide to others looking to book this property is that the water tastes very bad (well water) and you must plan to bring your own drinking water for coffee and and basic water needs. Also if weather is cold be aware that there is an electric room heater only which does make noise switching itself on and off much of the night. 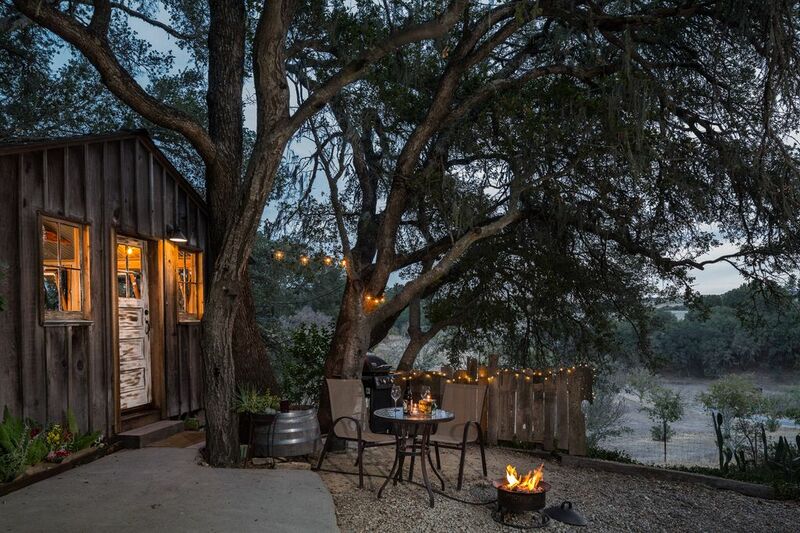 This was a very cozy cabin in the heart of Paso Robles/Templeton wine country. Great location to get to all the sights you want to visit as well as a fairly quick trip over to the coast. Accommodations were very clean, bed comfy and a very nice touch of flowers in the room upon my arrival. We have stayed in the Carriage House and decided to stay in the Cabin this time to celebrate our Anniversary and we were not disapointed. The morning views out the large picture windows we spectacular. We will defiantly be back for a visit! What a fun quaint place to stay while visiting this area. Adorable cabin. All the necessities. Close to Paso and the coastal towns of cayucos and cambria are a hop skip away. Owners give you privacy but if you need anything are very responsive. Thanks again for the great extended weekend. Gorgeous place with incredible views, truly surrounded by vineyards. Couldn’t have been happier with our stay. The Cabin is located in a rural setting but within minutes to Paso Robles and Templeton. This is a perfect place to just relax and BBQ or go wine tasting. Property is surrounded by winery's on all sides.